As a mama of a 2 year old (I still can't believe my Vien bean is now two years old! ), we're pretty familiar with the odd cut, bump or bruise. That doesn't by any means suggest that we're careless! But naturally, accidents happen and when they do, I make sure our natural first aid kit is never too far away and is equipped with the most effective natural remedies for any occasion! It's funny to think how my first aid kit has transformed so much over the years. It used to be filled with all of the conventional over-the-counter medications and toxic chemical-containing creams (which by the way, can end up doing more harm than good). Nowadays, my natural first aid kit consists of products you likely already have in your home. When in doubt, any first aid kit is better than nothing. But the more naturally-derived products you can start including in your first aid kit, the better off you'll be as you won't have to worry about any potential negative side effects that can come from things like NSAIDs (Aspirin, Ibuprofen etc). We're brought up to think we can use these sorts of remedies without consequences, when in fact, many of them can come with negative side effects. NSAIDs have actually been shown to degrade the intestinal lining and lead to things like ulcers (eep!). For that reason alone, I truly believe in the importance of transitioning our conventional first aid kits over to natural first aid kits. So, to inspire you to start putting together your own natural first aid kit, I've highlighted some of my favourite natural remedies below! Keep in mind, this natural first aid kit goes beyond covering the odd, bump and bruise and also prepares you for things like digestion issues when they strike! If you've ever suffered from a sunburn or a burn of any kind, you're probably already quite familiar with the soothing relief and healing properties that aloe provides. 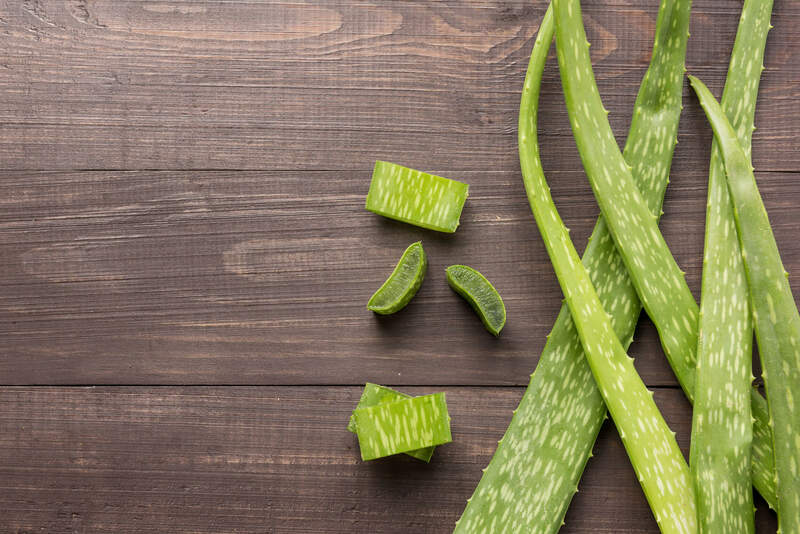 That's because the gel in aloe contains an array of bioactive compounds including vitamins, minerals, amino acids and antioxidants that help to support healing. It's so effective that the FDA initially approved aloe vera ointment as an over-the-counter medication for skin burns back in 1959. It's now said that aloe vera can help to reduce the healing time of burns by approximately 9 days compared to conventional medication. Aloe also has anti-bacterial and anti-viral properties that can help to inhibit the growth of harmful bacteria that could lead to infections. So if there's anything you might typically use Polysporin for, you can try using aloe instead! I typically use this Turmeric Honey Paste as a beautifying mask, but occasionally, I'll put it to use to combat insect bites, inflamed dry skin or eczema. I actually recommend this Turmeric Honey Paste recipe as a natural healing remedy in my Eczema Healing Guide along with other dietary, supplemental lifestyle recommendations. The reason why it's so effective is that the honey contains antibacterial properties and the turmeric is a potent anti-inflammatory which helps to reduce inflammation and redness. 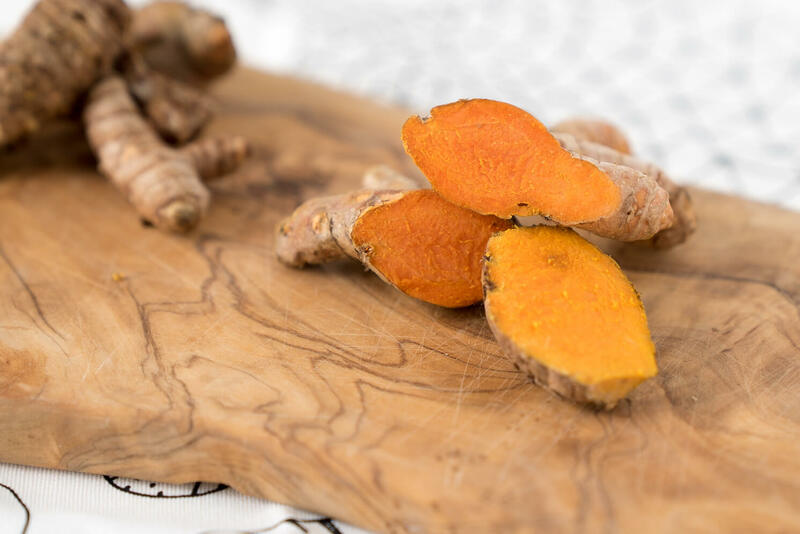 The active component in turmeric, curcumin, is so effective that it has actually been compared to potent drugs such as hydrocortisone, phenylbutazone and over-the-counter anti-inflammatory agents such as Motrin! And honey ... well, I just LOVE honey and always have it in my home for when I want to whip up a Turmeric Ginger Tea. Its immune-boosting properties are enough of a reason on its own to always have this in your home for when you feel any sort of sickness coming on. But aside from that, it is very soothing for the treatment of burns and wounds, to the point where honey-infused bandages have become a thing! Alternatively, you could just make your own band-aid by applying raw honey and ghee to a dressing and applying it to the infected wound. If you're looking for my favourite brand of raw honey, look no further than JOYOUS APPROVED! There are over 327 studies that address tea tree oil's anti-microbial abilities. In other words, tea tree oil doesn't mess around and is an essential product to have in your natural first aid kit. It can help to support healing for everything from cold sores, fungal infections (athlete's foot, candida, toenail fungus), head lice, insect bites, sores, and sunburns. It's also often used as a natural way to soothe symptoms of the common cold such as head congestion, runny noses, coughs and sore throats. You can either put a few drops in a diffuser or put your head over a hot pot of water containing 5-10 drops of tea tree oil and inhale the steam. Got a nail fungal infection? Get some tea tree oil! I actually had a client whose father suffered from a nail fungal infection and I advised that she put tea tree oil on the nail and it WORKED! The healing time may vary from person to person, but as little as 2-3 drops per day on the affected nail and surrounding tissue every morning and night is as effective as your over-the-counter alternative. And I'm sure by now you guys all know how much I love to cook, right? Well, with that often comes the odd burn (yes, even after you've been doing it for years on end!) But luckily, I have my good friend tea tree oil to turn to :) Keep in mind, I would only use tea tree oil for minor burns (the kind with redness, no blisters). Anything beyond that may require medical attention. If you do happen to get a minor burn, simply rinse the area with cold water then add a few drops of tea tree oil to the affected area. 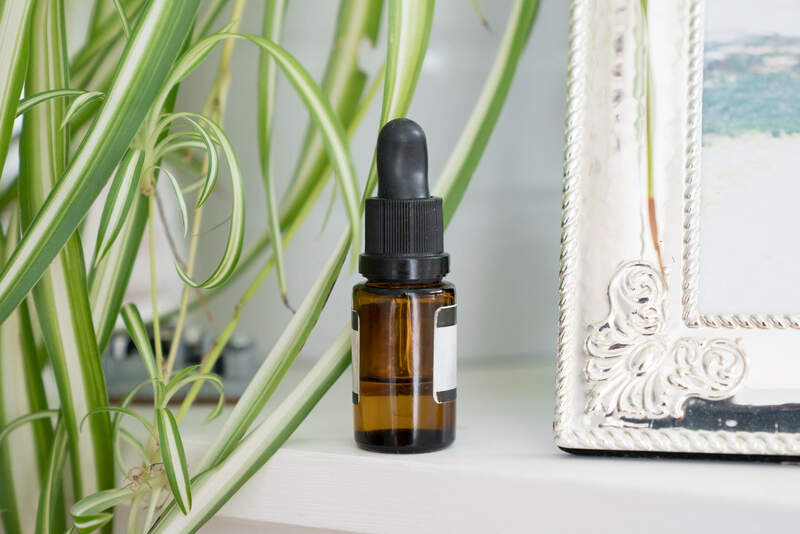 You can also make a healing salve by mixing 20 drops of tea tree oil with 3oz of unpasteurized honey and 1/2 tsp of triple-strength grapefruit seed extract, if that suits you better. For more information on the joyous powers of tea tree oil, you canread up on a post I wrote here. Boiron's Arnicare Gel is liquid GOLD! I know I say that about maple syrup, so let's call this the non-edible form of liquid gold, haha! As I mentioned previously, I have a 2-year-old daughter who is moving faster than I can even keep up with anymore. From time to time she might trip or bonk her head off of the coffee table, which is why I always make sure to have Boiron's Arnicare Gel nearby! If I apply it right away, it takes the swelling right down. It's amazing! Every mama should have this in their natural first aid kit. I love that it's free of parabens, perfumes, menthol, NSAIDs and has a soothing cooling effect. 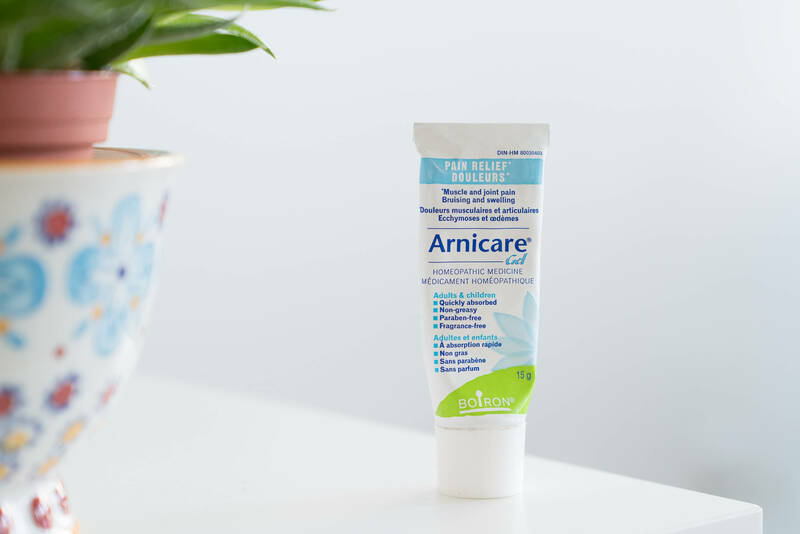 As you might have guessed, Arnicare Gel is made from Arnica montana and 100% naturally sourced medicinal ingredients. Arnica montana is the Latin name for a perennial that grows 1-2 feet tall with bright, yellow daisy-like flowers. It has grown to be one of the most popular homeopathic remedies around the world to provide relief for sore muscles, stiffness, bruise discolouration and swelling from bumps. I have even used it the odd time for minor burns while cooking or for muscle pain and it has been a miracle worker! All you have to do is apply a thin layer of it to the affected area and because it is water-based, it absorbs easily without leaving a sticky film-feeling. You can typically find Boiron's Arnicare Gel at your local health food store or you can use their online retail finder to find the closest retailer to you! The main reason I keep ACV in my natural first aid kit is for when indigestion or bloating strikes. Thankfully, this doesn't happen often, but occasionally if I'm eating at a restaurant and a certain food doesn't jive with me, I'll may get a belly ache. It wasn't until nutrition school where I learned that drinking 1 tbsp of ACV in 1/2 cup of room temperature water was all I needed to help break down the food and provide relief from indigestion. 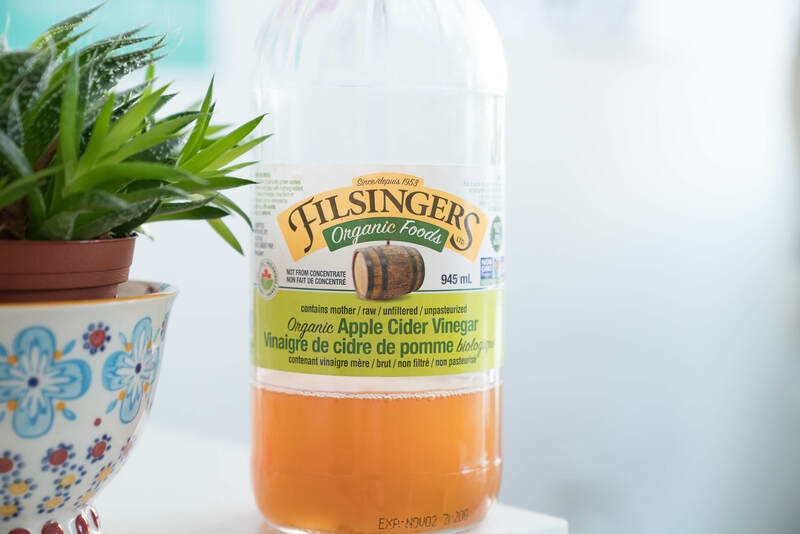 So if you're one to reach for the TUMs, try reaching for the ACV and prepare to be amazed! Like tea tree oil, ACV can also provide relief for burns, but more specifically, sunburns. By putting 1 cup of ACV in lukewarm bath water along with 1/4 cup of coconut oil and your favourite essential oil, you will experience relief from your sunburnt skin. What's one thing that you always keep in your natural first aid kit? This post was created in a limited-partnership with Boiron Canada, however, all opinions are always my own. Read more about my partnership ethos here. Somewhere I read to keep chunks of aloe vera leaf in a bag in the freezer for kitchen burns. It's wonderful to have it right at the scene! I had a severe burn from a motorcycle hot metal bar while getting off it after a long ride. Immediately, the pain hurt tremendously and I jumped into the bath water for one hour, letting the cold water run onto my leg. 24 hours later, an infection began while travelling, I bought antibiotic ointment till I had a physician give me a treatment for the pain and infection. Three weeksof limping and a scar for years resulted. It's better to get medical attention for surprising accidents; and someone who cares.